Bordering the Atlantic Ocean and Mediterranean Sea, Morocco is distinguished by its Berber, Arabian and European cultural influences. One of the most diverse African countries, Morocco is home to majestic high mountains, sweeping desert dunes, rugged and fertile coastline, and labyrinthine alleyways in historic medina cities and open air markets. The lyrical landscapes of the deserts and mountains are only matched by the rich traditional and contemporary society of the ever active influence of peoples and ideas in this colorful cultural crossroads. Explore the singular solitude of the desert, to count the stars and follow ancient trade routes, then dive into the festive chaos of the souqs. Your trip leader and local host will meet you in the lobby of the Melliber Appart Hotel l in Casablanca at 10 AM. From here, you will head to the ocean and visit the Hassan II Mosque. You’ll have a guided tour of this amazing place – the 3rd largest mosque in the world. After you visit here, you’ll have lunch and then head up the coast to Rabat, the current capital of Morocco where you will stop for the night. Upon your arrival here, you’ll have a guided tour of the important monuments in this ocean front capital city. The tour will included Hassan Tower, the Mausoleum of Mohamed V, and Kasbah of the Udayas, After your visit, you’ll head to your accommodations to relax a little before reconvening with the group for a welcome dinner at a nearby restaurant before heading back to your accommodations for a good night’s sleep. This morning after breakfast (9 AM), you’ll head inland to the lessor known Imperial City of Meknes. You’ll begin your tour of this city built by Sultan Moulay Ismail by visiting the Bab Mansour gate (which incorporates columns pillaged from Volubilis), Agdal reservoir - which may bring to mind the Grand Canal of Versailles - and Heri es-Souani, the former granary and royal stables that once housed 12,000 horses. After this tour, you’ll enjoy lunch before making the short drive to then nearby Roman ruins of Volubilis. 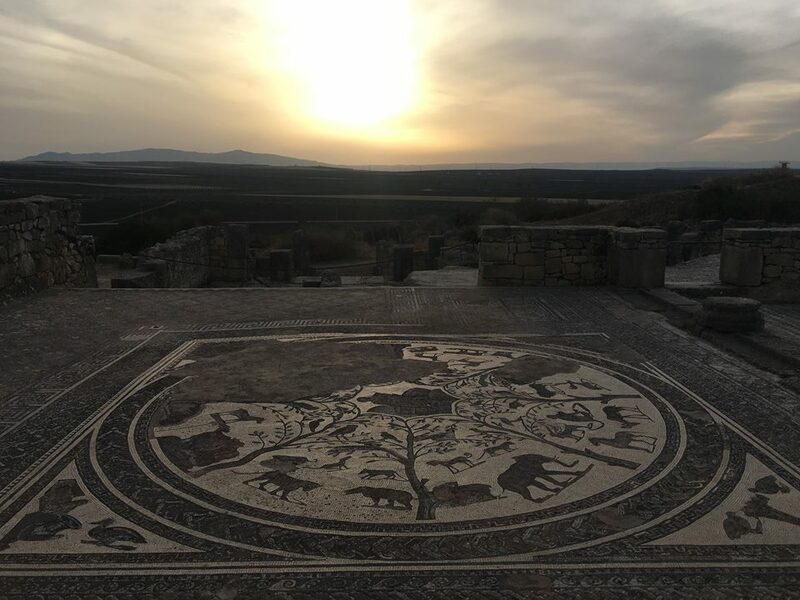 After a guided tour here, you’ll Along the way, you’ll visit the Roman ruins of Volubilis. After this visit, you will continue on to Meknes. Your visit will include the beautiful gate of Bab Mansour (which incorporates pillars pillaged from Volubilis), the tomb of Sultan Moulay Ismail, Agdal reservoir, and Heries-Souani (a former granary and stable). After this visit, you will drive the rest of the way to Fes arriving by early evening. Dinner will be together at the traditional riad. Day 3 : Fes Today after breakfast, your local guide will meet you at your hotel for a guided tour of the city. To start your tour, you will head to the Borj (towers) and get a panoramic view of the entire medina. Next, you’ll head to a mosaic house where you will have a demonstration of traditional pottery methods that are still used today by Moroccan artisans. After this, the tour will take you into the medina of Fes where you will discover the ancient streets and neighborhoods. This portion will be a walking tour in the medina and will take you to the tomb of Moulay Idriss II, Al-Qarawaiyin University, and other monuments. You’ll also visit the various artisan sections including the tanneries for which Fes is famous. You’ll be returned to your hotel by mid-afternoon. After breakfast, you will depart from Fez and head towards the sand dunes of Erg Chebbi near Merzouga. On the way, you will travel through the largest cedar forest in Africa which is also home to the barbary apes (aka Atlas Monkeys) which are sure to entertain. You’ll enjoy a picnic lunch in the cedar forest before youl continue over the Middle Atlas Mountains to the city of Midelt, located in the high plains between the Middle and the High Atlas Mountains, where you will stop for the night. After checking into your accommodations and having a mint tea welcome, if you wish you can go for a light hike in the ecological park that is next to Ksar Timnay. This is the beginning of the land of the Berbers, so after you’ve stretched your legs, you’ll have a delicious locally sourced dinner followed by live music and dancing. Day 5: Midelt to Merzouga After breakfast, you will depart from Midelt and travel over the High Atlas Mountains and then following the Ziz River Gorge to the desert. If this happens to fall on the Market Day in Rissani, you’ll head here to see the hustle and bustle of this dusty city. For lunch, you will get to try the local specialty of Medfouna (aka Berber Pizza). After your visit here, you’ll head to meet your camels and at sunset you will trek into the edge of dunes to your luxury camp for the night. (If you prefer, you can transfer to the desert camp via 4x4). Once there, you can climb the nearest dune to watch the sun set and the stars come out. Dinner will be served at camp followed by traditional music and more stargazing, before retiring to your tent for the night. This morning your camel guide will wake you early so that you can watch the sun rise over the dunes and then breakfast will be served at camp. When you are ready, you’ll head back to the edge of the dunes via your camels and make your way towards Dades Valley. Along the way, you’ll stop to visit the ancient irrigation system that once brought water to the desert from the distant Saghro Mountains. After this, you’ll head to the oasis town of Tinghir where you will have a guided walk of the palmeraie and Mellah (old Jewish area). Next, you’ll visit nearby Todgha Gorge where you will walk through the most impressive part of the canyon. After this, you’ll head to your accommodations located in the breathtaking Dades Valley where you dinner will be waiting for you. Day 7: Dades and Valley of Roses This morning after breakfast, you’ll make the short drive through the Dades River Valley to the village of Taltnamarte near the small city of Kelaat M’Gouna in the heart of the Rose Valley. If the roses are in bloom, you’ll join some locals and try your hand at picking the pink blossoms. After this you’ll see how you did by taking your roses to the local weighing station. After this you’ll head to the local cooperative to learn about the distillation process. Next, you’ll enjoy a traditional couscous lunch with a local family. Following lunch, time permitting, you’ll explore the local area and/or return to your accommodations. Dinner will be served at your hotel. After breakfast, your early departure will take you on the road of 1000 Kasbahs and through the city of Ouarzazate, pronounced: Wor-za-zet and known as the Hollywood of Morocco. After a quick rest stop, we will make the short drive to the UNESCO World Heritage site of Ait Ben Haddou, before crossing over the High Atlas Mountains via the Tizi n’Tichka Pass, reaching an altitude of nearly 7500 feet above sea level before descending to Marrakech by early evening. Dinner will be on your own at one of the many eateries nearby. Day 9: Marrakech After an early breakfast, your local city guide will meet you at your riad and show you all around Marrakech. You’ll first walk to nearby Koutobia Mosque. From here, you’ll tour by bus through the Kasbah (Bab Aganou, Saadian Mosque, and the Jewish Quartier). You’ll deboard the bus in the Mellah (Jewish Quartier) and walk to visit Bahia Palace. 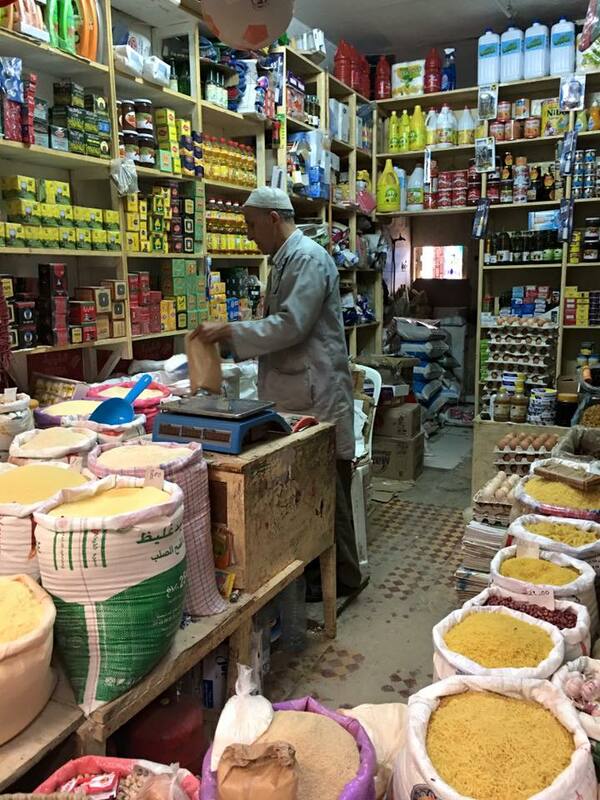 After your visit here, you’ll continue your walking tour into the souk and through the winding maze-like medina. The tour will finish at lunchtime and you’ll have the rest of the day to explore on your own. After breakfast, you’ll have a little free time before meeting the group for a 11 AM departure to Essaouira. You’ll have the rest of the day to discover Essaouira on your own. Day 11: Essaouira This morning after breakfast you’ll head to the market to buy all of your ingredients before heading to your guides home for a full day cooking experience. After all of that work, of course, you’ll have worked up an appetite, and will be ready to eat your creations. After your class, you’ll have the rest of the afternoon/evening free to prepare for your departure and do some last minute shopping. NOTE ABOUT ACCOMMODATIONS: To make your experience as close to the local people as possible, and based on the size of our group, Cross Cultural Journeys and our local partners in Morocco will secure the best available; clean, comfortable and centrally located accommodations in the cities and villages that we visit. The accommodations will range from 4-5 star local Rhiads, Khasbas and Luxurious Desert Tent Camps, to more basic, local and simple hotels. This itinerary is subject to change to take advantage of the serendipity of the moment when we are in Morocco; to meet someone special, to engage in an activity that might occur unexpectedly, or to accommodate circumstances beyond our control. Please note that due to the nature of this itinerary as well as unforeseen circumstances beyond our control, restaurants or hotels may change at the last minute in similar category. INCLUDED: In country transportation per itinerary; best available accommodations in Morocco (double occupancy); meals as marked (B/L/D) per the itinerary; Cross Cultural Journeys trip manager; Moroccan English speaking local guide; all entrance fees on itinerary; preparation materials; tips for bellman and hotel staff, included meals on itinerary and bottled water on the bus. NOT INCLUDED: International air travel to Morocco; meals not on itinerary; alcoholic drinks; excursions not on the itinerary; tips for local guide and driver (optional, yet customary); and a Travel Protection Plan (travel protection and information will be sent upon registration). TRAVEL PROTECTION: For more information on the available plans or to enroll, enroll here or contact Travelex Insurance Services at 800-228-9792 and reference location number 47-0272. Please advise Travelex that Cross Cultural Journeys is the travel company for this trip.